The Federal Trade Commission and more than 100 federal, state and local agencies, consumer groups and national advocacy organizations, will participate in the 19th Annual National Consumer Protection Week (NCPW), held March 5-11, 2017. NCPW is a nationally coordinated campaign to inform Americans of their consumer rights while providing them access to free consumer-related resources. Acting Chairman Maureen K. Ohlhausen, who will participate in the FTC’s military Twitter chat on March 9, 2017, noted her anticipation for this year’s NCPW, highlighting her focus on the military community. She also stressed the importance of the campaign's website, NCPW.gov, which hosts a variety of resources for consumers and their advocates on topics that can help consumers make informed buying decisions and avoid scams. Since its creation, the FTC’s Bureau of Consumer Protection has focused agency resources and national experts on safeguarding American identities, financial records and other elements related to consumer activity. Along with the Bureau of Consumer Protection, the Bureau of Competition supports the FTC’s consumer protection mission by protecting the competitive process, which can deliver lower prices, enhance innovation, and increase quality and choice for consumers. To participate in English, follow USA.gov and FTC on Facebook. Ask your questions via livestream beginning at 2:30 p.m. ET on March 7. FTC staff will host a Twitter chat with the Connecticut Department of Consumer Protection (@CTDCP) to answer consumer questions on March 8, 2017 beginning at 4:30 p.m. ET. Staff will answer questions for an hour on debt, identity theft, online safety, and other consumer protection topics. To participate in English, follow @FTC, @milconsumer and Tweet questions with the hashtag #NCPW2017. For Spanish, follow @LaFTC and use #FTCcharla. FTC will host an additional Twitter chat with the Colorado Attorney General’s office (@StopFraudCo) to answer consumer questions on March 9, 2017 beginning at 3:00 p.m. ET. Staff will answer questions for an hour on tax identity theft and imposter scams. To participate in English, follow @FTC, @milconsumer, @MOhlhausenFTC and Tweet questions with the hashtag #NCPW2017. For Spanish, follow @LaFTC and use #FTCcharla. During NCPW, partners and hundreds of community groups across the country host events to promote general consumer education or highlight a specific issue. For more information on National Consumer Protection Week, visit NCPW.gov and subscribe to the blog. to commit various crimes, including filing fraudulent tax returns. steps to help protect employees from tax-relatedidentity theft. email compromise (BEC) or business emailspoofing (BES). The Security Summit partners urge all employers to be vigilant. ofemployee W-2 information and conducting wire transfers. to phishing@irs.gov and place “W2 Scam” in the subject line. Center (IC3,)operated by the Federal Bureau of Investigation. engines tofind technical help with taxes or tax software. January is the official start of "tax-scam season." The goal of these con artists is to fool and defraud taxpayers — in other words, to scare you into giving them your money, your bank account information and your Social Security number. They do it by using phone scams or a sophisticated e-mail trick called phishing. In a phishing scam, the scammer sends an e-mail that looks and sounds very real. The e-mail of choice during tax season looks as if it comes right from the Internal Revenue Service. The IRS has made it clear that agents will never call you as their first contact about a tax issue. So if someone calls you and says they're the IRS, and you have not already received an official notification in the mail, just hang up on the fraudster. If you do receive a letter from the IRS, it's in your best interest to contact the agency directly (800-829-1040) to confirm the issue is real. For more cool stuff like this, follow me on Twitter @jimpavia. The internet is awash in so-called "high-yield investment programs" or "HYIPs". These are unregistered investments typically run by unlicensed individuals - and they are often frauds. The hallmark of an HYIP scam is the promise of incredible returns at little or no risk to the investor. A HYIP website might promise annual (or even monthly, weekly, or daily) returns of 30 or 40 percent - or more. Some of these scams may use the term "prime bank" program. If you are approached online to invest in one of these, you should exercise extreme caution - it is likely a fraud. Are you struggling to pay off your student loans? According to the Federal Trade Commission, debt relief companies are luring unsuspecting graduates with promises of student loan forgiveness or debt reduction. These companies will say they can help reduce your monthly payment or get your loans forgiven after receiving an upfront fee. Companies target students by phone or text, on the radio and online through featured ads promising relief through government programs or by disputing loans. Students who pay these companies frequently don't get their student loans forgiven or reduced. Often at best, the companies are able to put loans into deferment while the loan's interest keeps growing. 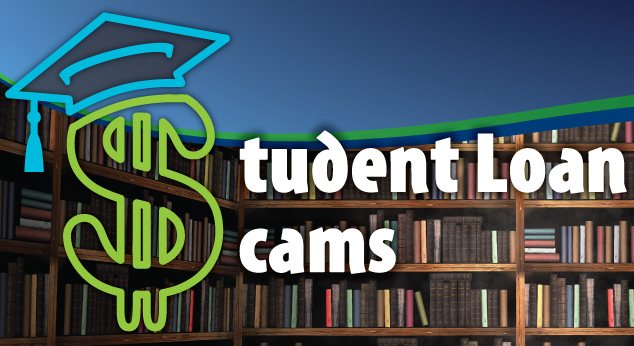 At worst, students are defrauded out of thousands of dollars. You shouldn't have to pay an up-front fee. If you pay to reduce or eliminate your student loan debt, you will most likely not get any help or your money back. Before scammers know the details of your situation, they might promise to dissolve your loans through a loan forgiveness program or by disputing the loans. However, no one can promise total loan forgiveness. Only scammers will tell you to stop paying your student loans. Sometimes scammers will tell you not to speak with your loan servicer so the company can negotiate a better settlement for you. However, not paying student loans can damage your credit, and your loan balances could balloon. There's no guarantee the company will be able to get a settlement. A U.S. Department of Education seal does not mean a company is legitimate. Scammers typically use official-looking names, seals and logos, and they tell you they have special access to certain repayment plans, new federal loan consolidations or loan forgiveness programs. If you have federal loans, go to the U.S. Department of Education directly at www.StudentAid.ed.gov to find out what options are available to you. To get you to act fast, scammers tell you that you could miss qualifying for repayment plans, loan consolidations or loan forgiveness programs if you don't sign up right away. Don't be rushed into a bad decision. You have time to check out your options. Some companies may tell you they can lower your monthly payments or interest rate by combining your federal and private student loans. However, consolidating federal and private loans comes with a cost. Doing so eliminates many benefits and protections offered by federal loans. The Florida Department of Agriculture and Consumer Services is the state's clearinghouse for consumer complaints, protection and information. 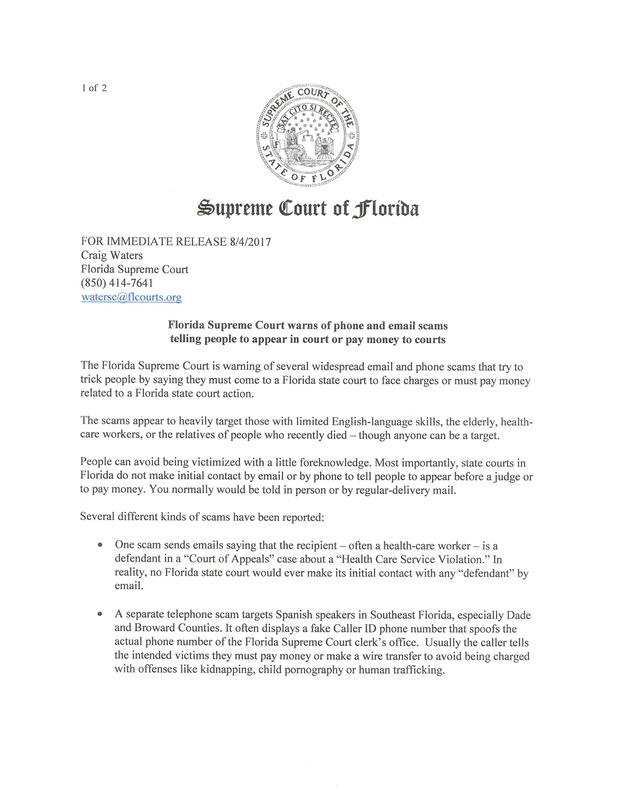 Consumers who believe fraud has taken place visit FreshFromFlorida.com or contact the department at 1-800-HELP-FLA (435-7352), 1-800-FL-AYUDA (352-9832) en Español. through the Contact Us page of our website at www.800helpfla.com. The public is bombarded with ads for persons and firms offering to provide financial services. While many are reputable, some are not. To protect yourself please follow some simple common sense rules. RULE #1 - If it sounds too good to be true it is!!! Do not fall for offers that provide unrealistic rates of return. Think Bernard Madoff. RULE#2 - Understand exactly what you are investing in. Do not hesitate to ask questions. If you don't understand what you are investing your hard earned money in DON'T invest. RULE#3 - Several organizations provide information on financial advisors/brokers as it relates to problems they may have had and their qualifications. Some of these organizations are: The Securities and Exchange Commissionwww.advisorinfo.sec.gov, Financial Industry Regulatory Authority www.finra.org/brokercheck and The Consumer Financial Protection Bureau www.consumerfiance.gov/about.us/blog/know-your-financial-advisor . 1. Forget Facebook-Resist posting pictures of your vacation on social media while you are away. 2. You can't hide-Crooks know all the "secret" places, so forget about hiding your keys around the house. Instead ask a trusted friend or neighbor to keep a key. 3. Don't advertise big buys-An empty computer or television carton left on the curb is a flag to crooks. Bring box to recycle center or cut it up. 4. Stay well-trimmed- Overgrown shrubbery provides cover for thieves. Keep the front of your house well lit and guard access to your backyard. 5. Mail-Stop your mail. If the post office places a mail hold notice in your box for mail personnel to skip box remove notice. Thieves can also see it. 6. Lights-Insure lights are on timers. Nothing screams empty house more than complete darkness. 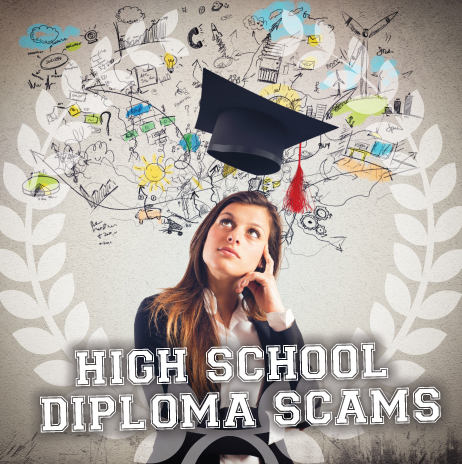 The Federal Trade Commission has filed charges against operators of online "high schools" that claim to be legitimate, but are alleged to be little more than diploma mills charging anywhere from $135 to $349 for a worthless certificate. The operations bought a number of website names designed to look like legitimate online high schools using terms like "GED" and "GED online" to lure individuals to their the bogus sites. Once consumers arrive at the schools' sites, they are met with messages that imply that the diplomas offered by the defendants are equivalent to an actual high school diploma. If a program says you can earn your diploma with just "life experience," it's almost certainly a scam. The operators of the online and correspondence schools tap a market of thousands of students who didn?t graduate from traditional high schools, but find they need a diploma to get employed or find a better job. If you didn't graduate from high school, but want to get your diploma, you can get what is called a "high school equivalency diploma" or "high school equivalency credential." You earn them by taking a test or enrolling in programs to earn class credit. You might have heard of the GED test. That's one way to get your equivalency diploma, but there are other tests and programs to choose from, depending on where you live. Many people earn a high school equivalency diploma by taking a test. Tests offer some flexibility, allowing you to study on your own time and at your own pace. However, you have to take them at a set time and place and the tests can be challenging. Most states will accept some credits from online classes, but typically only a few. Legitimate online courses will require you to do real class work, not just take a test. If an online class does not require substantial reading, writing, quizzes and tests, or offers coursework you can finish in a day, it's not the real thing. No classes? No in-person test? All online? That's a scam. Legitimate programs with classes for credit mean you'll invest weeks or months of time. And real high school equivalency tests are offered at specific days and times, not on-demand. Most people don't pass without really studying. No legitimate high school equivalency program lets you take a test or classes for free, then charges you for the diploma. You might pay for classes or testing, but you shouldn't have to pay for the diploma itself. The federal government doesn't offer programs for earning high school diplomas. Legitimate tests or programs are approved by your state. To find out what tests are accepted and recognized by Florida's education standards, contact the Florida Department of Education at fldoe.org or call (877) 352-4331. For additional information, or if you feel that you've become a victim of a diploma scam, contact the department at 1-800-HELP-FLA (435-7352), 1?800-FL-AYUDA (352-9832) en Español, or visit 800helpfla.com. National Consumer Protection Week is a coordinated campaign that encourages people to learn about their consumer rights and to make better-informed decisions. NCPW is also an opportunity to address a particularly troubling and challenging consumer protection issue, identity theft. 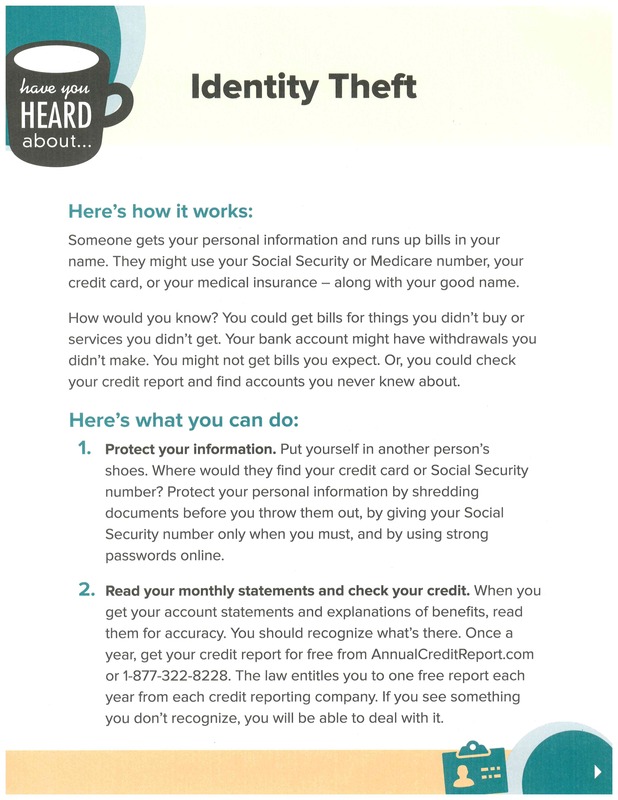 Identity theft occurs when an individual's personal information, such as their name, Social Security number or credit card number is used without their consent to commit fraud and other crimes. Identity thieves commonly use the phone, postal mail, email and the Internet to trick unsuspecting consumers into giving out personal information. Many victims of identity theft are unaware that their information has been compromised until they are denied credit or sent a bill for purchases they did not make. According to the Federal Trade Commission, Florida has the highest per capita rate of reported identity theft complaints in the nation. Prevent identity theft by safeguarding your information. Shred financial documents and paperwork, protect your Social Security number, never click on links sent in unsolicited emails and keep your personal information in a safe place. Never give out personal information unless you are certain you know who you're dealing with or you initiated the contact. Order a free copy of your credit report from each of the three major credit bureaus once a year from Equifax, Experian and TransUnion, and review them for discrepancies, such as accounts that you're unaware of or inaccuracies of your information. Children have clean credit records, making it easy for the criminal to create new accounts. Most parents don't think to check their children's credit histories, allowing the crime to go undetected for years. Many cases of child identity theft aren't discovered until the child applies for a loan or their first job. The Keeping I.D. Safe (KIDS) Act enables parents and guardians to create and freeze credit records for their children, effectively blocking thieves from using their personal information. For more information about placing a freeze on your child's credit, visit FreshFromFlorida.com/ProtectYourChild. For additional information, contact the Florida Department of Agriculture and Consumer Services at www.800helpfla.com or by call 1-800-HELP-FLA (435-7352) or 1-800-FL-AYUDA (352-9832) en Español. Tax-related identity theft occurs when someone steals your Social Security number (SSN) to file a tax return and claim a fraudulent refund. You may be unaware that this has happened until you file your return and discover that a return already has been filed using your SSN, or the IRS may send you a letter saying they have identified a suspicious return using your SSN. More than one tax return filed within one year, using your SSN. 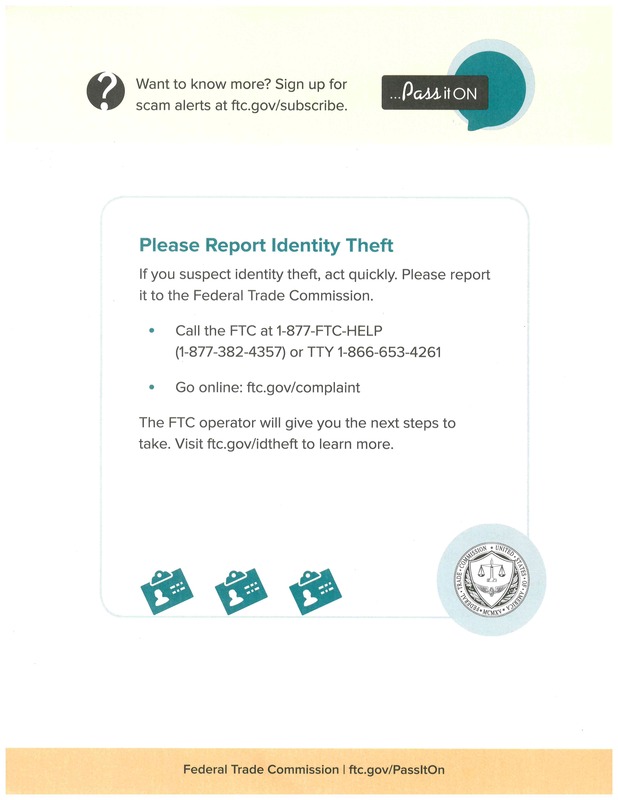 File a complaint with the Federal Trade Commission (FTC) at IdentityTheft.gov. Complete IRS Form 14039, Identity Theft Affidavit, if your efiled return is rejected because of a duplicate filing under your SSN or you are instructed to do so. Use a fillable form at IRS.gov, print, then attach the form to your return and mail according to instructions. If you previously contacted the IRS and did not have a resolution, call 1–800–908–4490. They have specialized teams that can assist with tax-releated identity theft. For additional information, contact the department at 1–800–HELP–FLA (435-7352), 1–800–FL–AYUDA (352-9832) en Español, or visit 800helpfla.com. Richmond, VA – The U.S. Marshals Service is warning the public today of a telephone scam involving a man posing as a U.S. Marshal. The man reportedly identifies himself as a U.S. Marshal while calling victims to advise that he or she has missed federal grand jury but can avoid arrest by paying a fine immediately. There are several reported incidents of this scam taking place in Hampton Roads. The Marshals Service became aware of the scam after receiving several calls from alert citizens in the Norfolk, Virginia area. “This scam has been replicated in other cities in the state and around the country, and we want the public to be aware of this criminal activity”, stated U.S. Marshal of the Eastern District of Virginia Robert Mathieson. The U.S. Marshals Service is a federal law enforcement agency and does not seek payment of fines or fees via the telephone for individuals. The U.S. Marshals Service urges individuals not to divulge personal or financial information to unknown callers and highly recommends the public report similar crimes to the FBI or their local police or Sheriff’s office if they are the victims of fraud. For internet related fraud, the FBI Internet Crime Complaint Center can be contacted at www.ic3.gov. 1.) 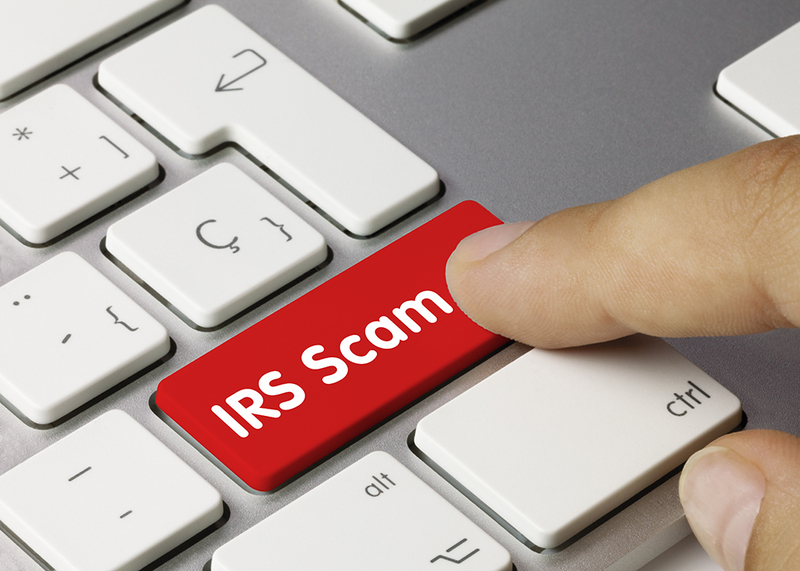 The IRS NEVER asks for personal or financial information via email, text, or social media, and it will NEVER contact you by phone to demand payment. Report suspicious email to https://www.irs.gov/uac/Report-Phishing. 2.) 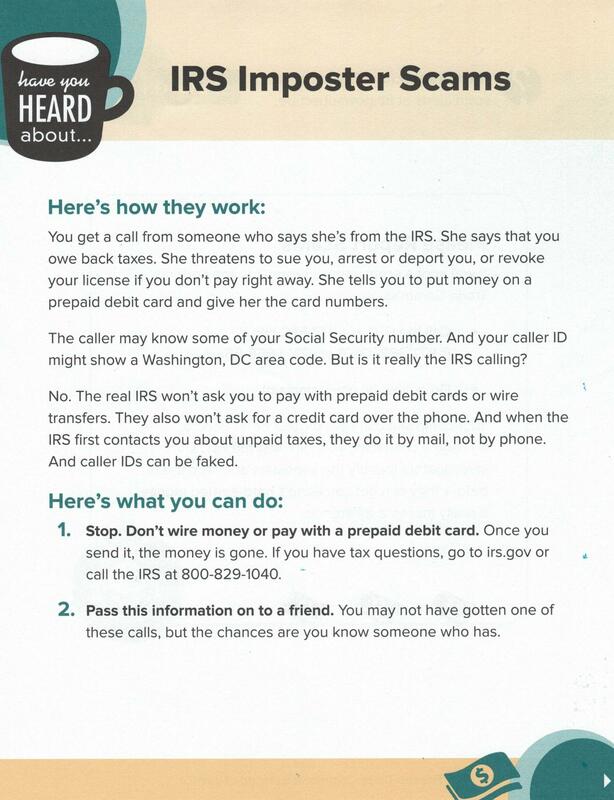 The IRS will NEVER ask for credit card numbers over the phone, require payment without allowing you to question it or appeal, or threaten you with arrest for nonpayment. 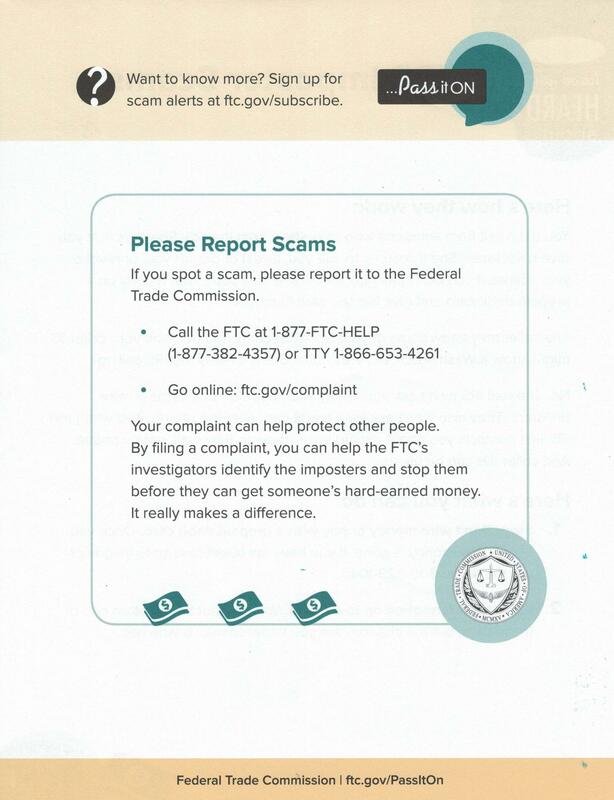 Report fraud to the IRS at 800-366-4484 and at https://www.treasury.gov/tiga/contact_report_scam.shtml. Happy New Year from Treasure Coast Crime Stoppers. Assets are commonly taken via forms of deception, false pretenses, coercion, harassment, duress and threats. If you, or someone you know, has been the victim of financial exploitation the following are resources to both obtain information about financial exploitation and also report it. Charities depend on the generosity of donors to support them for various causes and purposes. Many charitable organizations use your donations wisely; however, some may misrepresent their fundraising intentions or solicit for phony causes. Keep these tips in mind before making a donation. 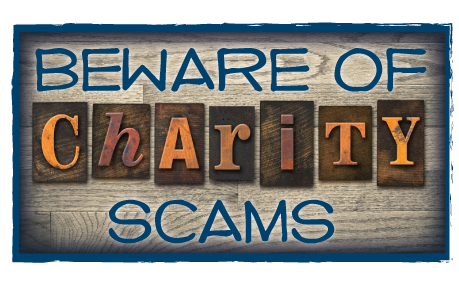 Scammers take advantage of people by pretending to be a real charity in order to commit fraud. Frequently, bogus charities will exploit a recent natural disaster or tragedy, promising to use the donations to aid victims. It is important not to judge a charity solely on its name. Many organizations may use names similar to well–known charities and organizations. Ask the charity or organization why it is asking for donations and what purpose will be served. Florida law gives the prospective donor the right to request and receive a copy of a charity’s financial report before donating. You can also visit our online Gift Givers’ Guide at 800helpfla.com to view a charity's financial information and current registration status, or call 1–800–HELP–FLA (435-7352). Be aware that many telephone appeals for funds are made by paid solicitors, not volunteers. The solicitors often work for a for–profit firm hired by the organization. Telemarketing is expensive and may entail substantial fundraising costs. Ask the solicitor what portion of your donation will be retained by the charity. Some solicitors use high-pressure tactics and may even offer to send a "runner" to pick up your money immediatley. Don’t feel forced to make a quick decision without getting all the information that you need to make an informed decision. Reputable charities and organizations are just as happy to receive your donation tomorrow as today. If you decide to make a donation, never send cash. Typically, it is best to pay by check, made payable to the charity itself, not to the solicitor. If you decide to make a donation online, look for indicators that the site is secure, such as a URL that begins with "https:" (the "s" stands for secure). Always obtain and save a printed copy of your donation or a receipt showing the amount of the contribution. Not all organizations soliciting in the name of benevolence are true charities eligible to receive tax–deductible contributions. If this is important to you, ask about the organization’s federal and state eligibility for receiving tax deductible donations. Typically, such donations fall under Internal Revenue Code section 501(c)(3). All charities soliciting within the state of Florida (excluding religious, educational, political and governmental agencies) are required to register and file financial information with the Florida Department of Agriculture and Consumer Services. If a professional solicitor is requesting a donation on behalf of a charity, the solicitor also must be registered with the department and should be able to provide you with their registration number. Visit our online Gift Givers’ Guide at 800helpfla.com to view a charity's financial information and current registration status, or call 1–800–HELP–FLA (435-7352). For additional information, to verify a charity’s registration or financial status, or to file a complaint, contact the department at 1–800–HELP–FLA (435-7352), 1–800–FL–AYUDA (352-9832) en Español, or visit 800helpfla.com. An excellent source of information about cyber security can be found at www.secureflorida.org. 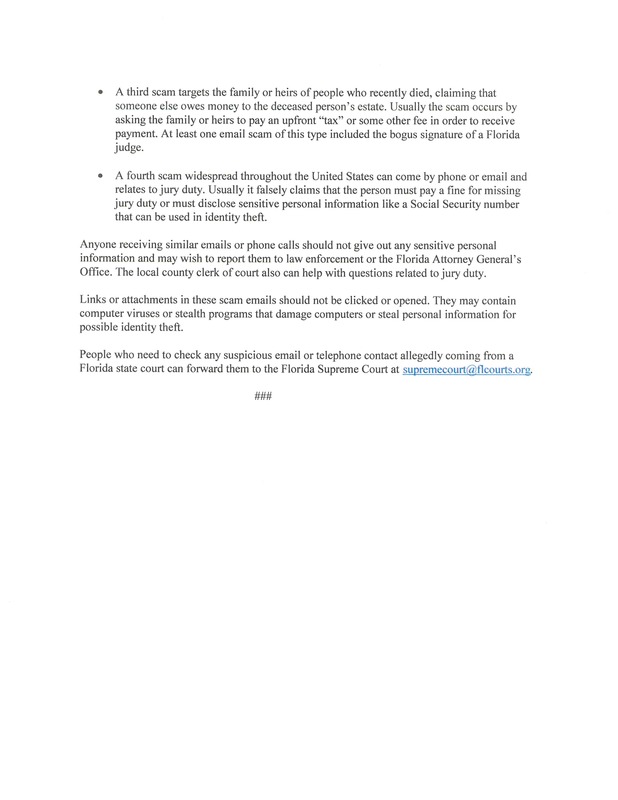 This information is provided by the Florida Department of Law Enforcement Office of Statewide Intelligence and provides information about internet safety and awareness. In addition to obtaining information citizens may sign up to receive a monthly newsletter, The Beacon. Treasure Coast Crime Stoppers encourages the public to utilize this source of cyber and internet information. 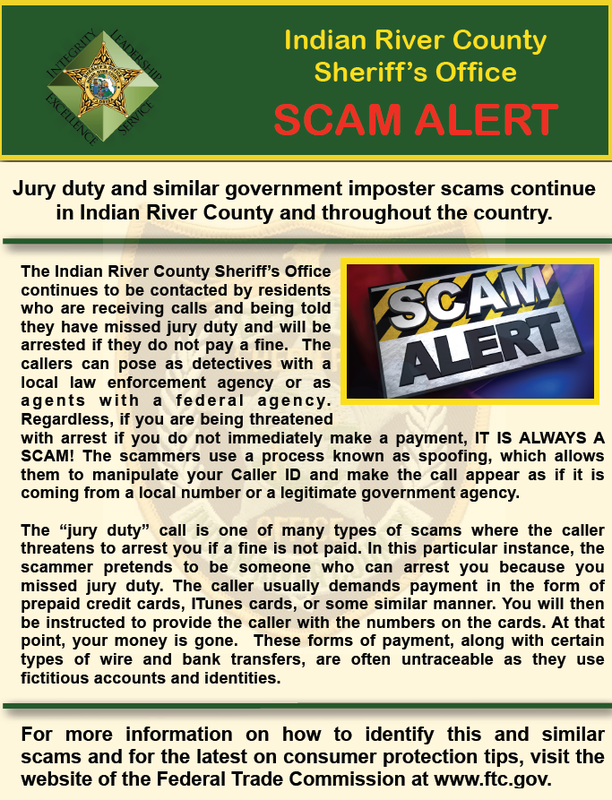 MARTIN COUNTY — Martin County Sheriff’s officials Tuesday are warning residents of a jury duty scam after an elderly woman was defrauded of $11,000 last week. A 77-year-old Hobe Sound woman told deputies on Aug. 26 a man claiming to be “an officer of the court” told her she had two arrest warrants for missing jury duty, records show. The caller told her that she could satisfy the warrants by paying a fine. The woman said she followed the caller’s instructions by going to a Winn-Dixie and purchasing 22 rechargeable money cards worth over $11,000. She then gave the caller the pin from each card and was told to mail the cards and purchase receipts in two manila envelopes addressed to Paul Clemons at the Martin County Courthouse, records show. After she told a friend what happened, she was told to call the sheriff’s office. No one named Paul Clemons is listed on the Martin County Clerk of Circuit Court directory. Deputies say the fraud attempt is targeted at the elderly, said sheriff’s spokeswoman Christine Christofek. Deputies say callers posing as law enforcement will ask victims for personal information before saying an arrest warrant was issued for missing jury duty. The caller tells victims the only way to avoid being arrested is to pay a fine by cash, credit card, or a Green Dot card. Christofek says the sheriff’s office does not make phone calls about arrest warrants. Sheriff’s officials say if you receive a call like this, to let the caller know you’re aware of the scam and hang up. 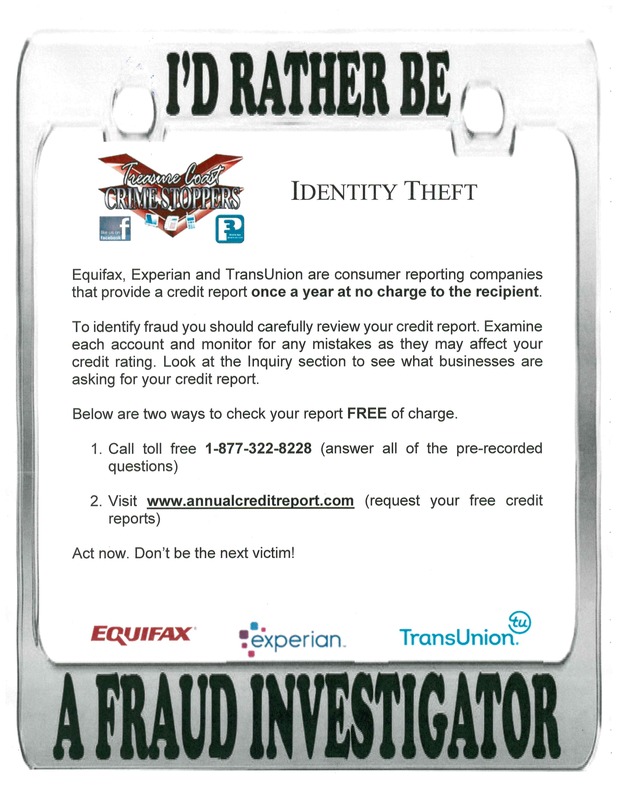 One way to help guard against identify theft is to obtain a copy of your credit report. The Fair Credit Reporting Act requires each of the nationwide credit reporting companies-Equifax, Experian, and Transunion-to provide you with a free copy of your credit report, at your request, once every 12 months. Only www.annualcreditreport.com is authorized to fill orders for the free annual credit report. IMPORTANT: Other websites that claim to offer "free credit reports," "free credit scores," or "free credit monitoring" are NOT part of the legally mandated free credit report program. In some cases the "free" service comes with strings attached such as having to sign up for a trial period. If you don't cancel during the trial period, you may be unwittingly agreeing to let the company start charging fees to your credit card. Checking your credit report will enable you to see if an unauthorized person has obtained a credit card or other type of credit in your name. TIP: Since you are entitled to a free copy of your credit report from three companies order one in January, one in July and one in November. This enables you to monitor your credit all year. To order your credit report visit www.annualcreditreport.com or call 1-877-322-8228. Or complete the Annual Credit Report Request Form and mail it to: Annual Credit Report Request Service, P.O. Box 105281, Atlanta GA 30348-5281. An excellent source of information on identity theft and resources to report and recover if you are a victim of identity theft is www.Identitytheft.gov. This program is run by the Federal Trade Commission (FTC). In addition the FTC has a website www.ftc.gov that contains excellent consumer information under the "Scam Alerts" and "Tips & Advise" tabs. The Florida Department of Law Enforcement, the Florida Sheriffs Association and the Florida Police Chiefs Association have partnered to provide a free service in which Florida residents can receive an email when a registered sexual offender moves into their neighborhood. To sign up for this service go to www.FDLE.STATE.FL.US/ . 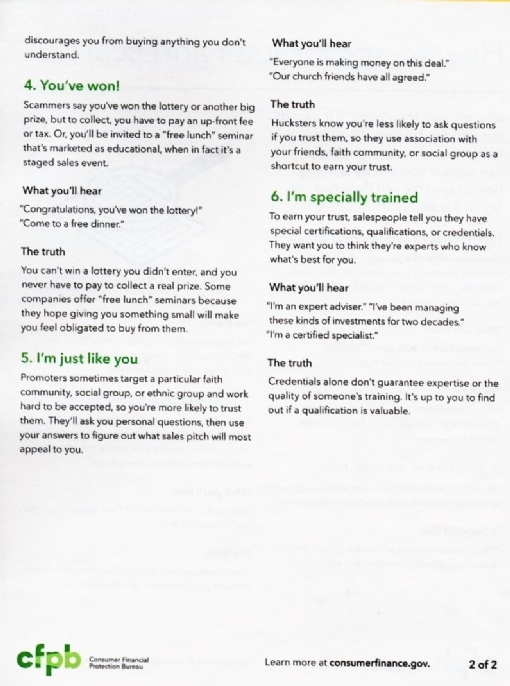 Many consumers have received bogus notifications indicating that they have won lotteries or sweepstakes through known organizations, only to find out that they have been scammed. The scam typically starts by the receipt of a letter stating that they have won a foreign lottery or sweepstakes, along with a cashier's check. The letter indicates that the check is to be used in order to cover any taxes and fees that are associated with claiming your prize money. All you have to do is deposit the check into your bank account and wire a portion of the money back in order to cover the taxes and fees on your winnings. Once they have received the money wire for the taxes and fees, they will then send you the rest of the prize money you've "won." Unbeknown to the recipient, the cashier's check accompanying the letter is fraudulent. You will be held liable for the full amount of the deposited check. Many consumers believe that if a check is deposited and the money appears in their account, the check must be valid. This is not always the case; there are actually federal laws that require that banks make funds available within one to five business days depending on the type of check, however it can take up to several weeks for a bad check to be discovered. NEVER pay money to receive money. Legitimate lotteries do not require you to pay a fee or tax to collect winnings. NEVER enter any foreign lotteries. If you play a foreign lottery through the mail or over the telephone, you're violating federal law. Ask yourself, did I enter this contest? You cannot win money or a prize in a contest unless you or someone else has entered on your behalf. Game promotions offering prizes totaling more than $5,000 must file with the Florida Department of Agriculture and Consumer Services seven days prior to commencement of the promotion. Even game promotions based in other states must be filed if they are conducted in Florida and/or are open to Florida residents and have prizes valued at more than $5,000. The Florida Department of Agriculture and Consumer Services is the state's clearinghouse for consumer complaints, protection and information. Our website provides consumers with information on our complaint mediation process, as well as allowing consumers to file a complaint online. For additional information, contact the department's consumer assistance center by calling 1-800-HELP-FLA (435-7352) or 1-800-FL-AYUDA (352-9832) en Español or visit us online at www.800helpfla.com. 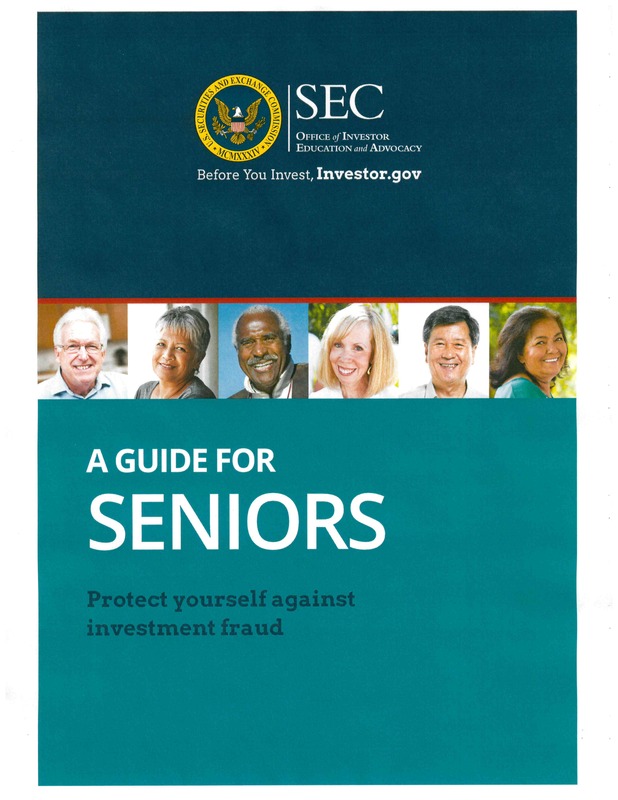 Staying informed is crucial to keeping you from becoming a victim of scams and fraud. The Florida Department of Agriculture and Consumer Services' (FDACS) website provides a wealth of information to help you achieve just that, from protecting your family, finances and even your computer. An informed consumer is the best defense against fraud and deception. 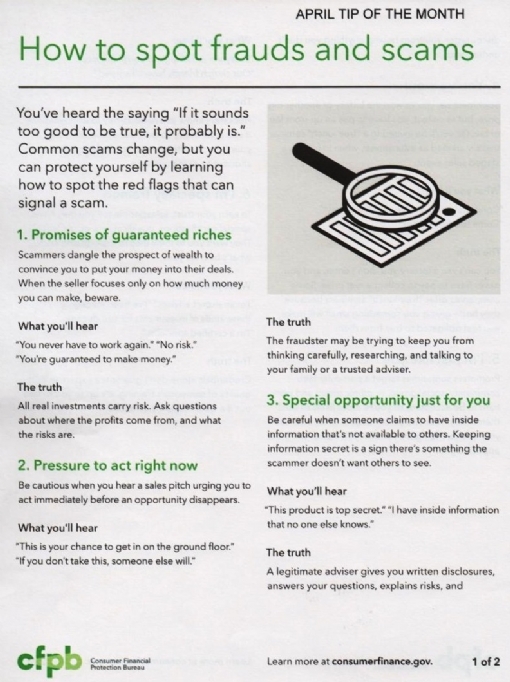 Unfortunately, scammers know how to get around even an educated consumer's better judgment by playing on emotions or promising huge returns. It's important for consumers to take advantage of the many resources available to be on guard against fraud. Our Little Black Book of Scams provides consumers with a list of common scams targeting Floridians every day, such as tax scams, payday loan scams, travel scams, government scams, charity scams and telemarketing scams. By sharing information on how to detect and avoid frauds and scams, you are better able to protect your loved ones and your community. Each year, more than 50,000 children in Florida become victims of identity theft, and more than $100 million is stolen from children whose identities have been compromised. Last year, the Florida Legislature passed a new law to provide children with an extra line of defense against identity theft. The Keeping I.D. Safe Act, requires credit reporting agencies to establish and freeze a credit record for a minor upon request by a parent or guardian. By freezing your child's credit, you can effectively block others from using it. FDACS also provides an online A to Z Resource Guide for those consumers that may have a question, concern, problem or complaint, and are unsure whom to reach out to or where to start. This guide allows consumers to search by topic and access the website and phone number of the agency or resource that can address their specific questions or concerns. If you received a recent offer or are dealing with a new business and are unsure about their history, visit our Business/Complaint Lookup. This page allows you to look up a business or individual, verify if they are licensed with the department and if they have received any complaints. Etizolam is a sedative that can cause temporary amnesia, and experts’ claims that it cannot be detected by most drug tests. It is not FDA approved to be made in the USA. 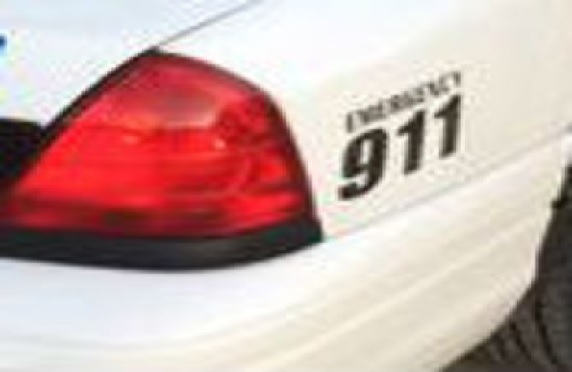 Florida Department of Law Enforcement said the State Crime Lab has found six cases in Florida so far where the drug has been used with five of these cases being in the last three months. See Video clip for more information. *This suggestion is brought to your attention by, Major Don Smith, Bureau of Law Enforcement, Indian River County Sheriff’s Office. An aggressive and sophisticated phone scam targeting taxpayers is active across the country. Callers claim to be from the IRS and tell the Victim they owe money and the IRS must be paid through a pre-loaded debit card or wire transfer. Victims are threatened with arrest. They alter their caller ID to indicate it is the IRS. 1.) The IRS will NEVER call to demand immediate payment nor will they call about taxes owed without first mailing a bill. More information is available at www.IRS.gov, click on tax scam tab. To help avoid a burglary to your automobile please lock it at all times including at home. Also avoid having anything of value visible in your automobile, including when you are at the beach. *This suggestion is brought to your attention by, Phil Weiler of Indian River County. “Drinking & Driving Changes Lives Forever”. *This suggestion is brought to your attention by TCCS Board Member, Freddie Woolfork of Indian River County. If you are not sure, just hang up. 1. If you are home always keep your doors locked. 2. Beware of people posing as Certain Individuals, always ask for Identification. Discharging fireworks is against the law! Leave fireworks to the experts. Topic – “Texting and Driving”. 1. Texting is Against the Law! 1. Pull to the side of the road in a safe manner. 2. Try to get completely off the road. 3. Stay inside your vehicle; let the Officer come to you. Boating and Alcohol don’t mix. Observe “No Wake Zones” in order to save our Manatees. Always have a means to call for help. Carry a cell phone. When boating always take plenty of water to avoid dehydration. Always wear a wide brimmed hat to protect against the sun’s ray. Observe boating rules of the road. Topic – “Lock It Or Lose It”. Lock your vehicle every time you leave it unattended. Purchase a locking gas cap to prevent gas theft. Always Slow Down In Construction Zones, Even If Workers Are Not Present. Avoid ATM’s that are obstructed from view or in poorly lit areas. Avoid using an ATM at night. Have your card ready prior to reaching the ATM. Always take your ATM receipt. If in your vehicle keep your windows up. Keep your engine running. Immediately leave area if you become suspicious. Never allow a stranger to assist you. Add Extra Security Measures to Sliding Doors. Deter Thieves by Installing Proper Locks. Deter Thieves by Installing Alarms on Doors and Windows. C. Do not brake or turn wheel suddenly – Hydroplane. D. Give extra distance to the vehicle in front of you. E. Pull off road and wait it out.